Last year was like no other for the marijuana industry. Previously considered a taboo topic, cannabis broke through as a legitimate business model in 2018 with the legalization of recreational weed in Canada this past October. When growing capacity is fully up to speed by the early part of the next decade, the industry could be generating in excess of $5 billion in sales per year. It also was a year of success in the United States, despite the fact that marijuana remains a Schedule I (i.e., wholly illegal) drug. Missouri and Utah legalized medical pot, with Vermont and Michigan giving the green light to adult-use weed. In total, 32 states now have legalized marijuana in some capacity, with 10 allowing adults to use the drug. Of course, the big question is what will 2019 hold for the cannabis industry, particularly in the United States where, according to Gallup, a record 2 out of 3 American adults now want to see pot legalized. That's up from just 25% in 1995. 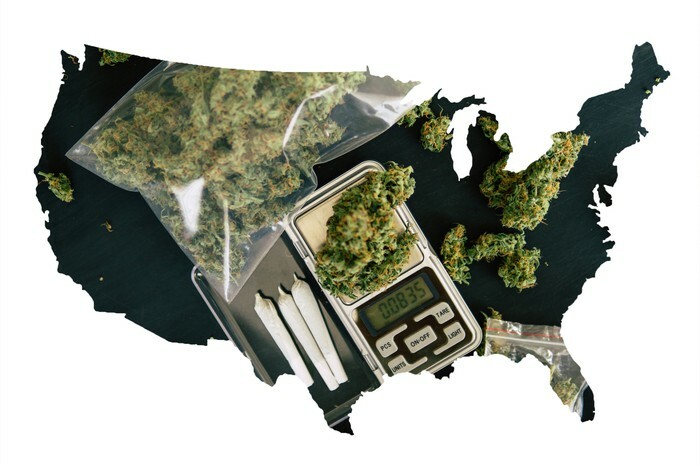 If a new bill proposal out of Oregon is any indication, the marijuana industry could see significant advances in the United States. As reported by Salem, Oregon publication The Statesman Journal, via Marijuana Moment, Oregon is on the verge of introducing a game-changing bill that would allow the state to export its dried cannabis to other legalized states. Democratic Sen. Floyd Prozanski already has signaled his support for the proposal, which is being spearheaded by Adam Smith, the executive director of the Craft Cannabis Alliance. If the bill were to become law, it would give Oregon's wholesalers the ability to export cannabis to other states that have legalized the drug, such as neighboring Washington, California, and Nevada. However, it would strictly forbid the export of marijuana through states where the drug remains illegal, such as neighboring Idaho. Why export, you ask? The obvious answer is that it opens the Oregon industry up to a larger prospective consumer pool. But the more logical answer is that it probably helps Oregon's growers better deal with statewide oversupply, which is weighing down per-gram pricing. Unlike many of the nine states that have legalized the sale of recreational pot (Vermont legalized adult-use weed, but does not allow for its retail sale), Oregon doesn't limit the number of licenses it'll issue. This has created a "too many hens in the hen house" scenario that's led to the state's oversupply. Exporting dried cannabis would, presumably, help abate some of that oversupply and possibly improve per-gram pricing. While this probably sounds like a big step toward a broader legalization of marijuana in the U.S., it's actually going to put Oregon on a collision course with the federal government. As noted, cannabis is a Schedule I substance at the federal level. This means it's entirely illicit, prone to abuse, and doesn't have any recognized medical benefits. The only reason the federal government has maintained a hands-off approach since recreational legalizations began at the state level in Nov. 2012 is because of the now-rescinded Cole memo. The Cole memo, written during the Obama administration by Deputy Attorney General James Cole, outlined a series of loose regulations that states would have to follow in order to not draw the attention of the federal government. This included having laws in place that kept cannabis out of the hands of minors and ensuring that marijuana grown within a state stayed in that state. On Jan. 4, 2018, then-Attorney General Jeff Sessions, perhaps the most ardent opponent of cannabis in Washington, D.C., rescinded the Cole memo that afforded the industry some form of federal protection. The only thing that kept Sessions from waging war on the marijuana industry was the Rohrabacher-Farr Amendment (also known as Rohrabacher-Blumenauer Amendment) -- a rider attached to federal spending bills that disallowed the Justice Department from using federal dollars to prosecute marijuana cases in legalized states. Even when the cannabis industry was afforded protections via riders and the Cole memo, it was contingent on marijuana not leaving the state. This suggests that Oregon's proposal, should it even gain enough support in the state's legislature, could be challenged by federal law. Then again, it's not even certain that Oregon's proposal to export cannabis, which wouldn't begin until 2021, would be received well by other states. In Colorado and Washington, the first two states to have legalized recreational weed in 2012, rampant oversupply from licensed growers led to a precipitous decline in the per-gram price of marijuana. Unless Oregon cannabis was substantially cheaper on a per-gram growing basis than domestic product, it's unlikely that much of any Oregon production would find out-of-state buyers in Washington or Colorado. The same story can be said of California, where recreational cannabis has been legal for just over a year now. It took just months for oversupply to flood the market and cause the marijuana machine to slow dramatically. For example, Scotts Miracle-Gro (NYSE:SMG), a company you might know best for lawn and garden care, witnessed a double-digit slowdown in organic sales from its Hawthorne Gardening subsidiary in 2018. Hawthorne supplies hydroponic, nutrient, soil and lighting solutions to the cannabis industry. Scotts Miracle-Gro noted in its fiscal 2018 results that Hawthorne struggled as a result of oversupply draining demand for new grow sites and, therefore, growing equipment. Scotts expects a better 2019, but it's pretty evident that this oversupply in adult-use states is going to take time to work through. In other words, Oregon's game-changing proposal may not be well-received by legalized states, either, because they're working through many of the same issues. Needless to say, it'll be interesting to see what, if anything, happens policywise in the weeks to come.